2. Grab the challenge button and write a post on your blog so we can spread the word. If you want, you can also add the button to your sidebar to help get the word out that the challenge is a go for 2014. 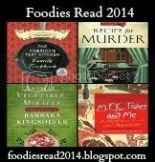 Hi and welcome to Foodies Read 2014!